My belieft in the future of work is identical to what I believe in how to retire early: you need to create passive income streams. The future of work is not be about serving one company or even a few companies for the rest of your life. It will be about our ability to harvest the opportunities of the web and create multiple income streams that replace our salaries and bonuses.Currently, I am seeing more and more new marketplaces such as taskrabbit.com, udemy.com, airbnb.com etc that allows one to monetise their time, expertise and even room space. There is virtually nothing stopping us from creating these income streams to free ourselves from the control of a corporation. For those who are familiar with my early retirement plan, creating multiple income streams is what I will be doing to retire early. One of these streams will be niche sites that focuses on specific topics. Hopefully, this will let them attract traffic from search engines. When that happens, I will earn some revenue off the traffic as some of the folks will either click on an ad or buy something through my affiliate links. Either way, I will paid by third party companies for sending them the traffic. New topic: I like to write about new topics because you don’t need to compete with establishes sites. In addition, there is also a lot of new stories which can give you lots of content ideas to write about. Using tracking technology on children is a relatively new area so I am sure there are many things I can create my blog posts around it. Can be montised: I don’t want to deal with complex business models so the topic I choose must have a clear path to monetisation. In this case, I can earn revenue by recommending gps trackers and earning a commision on them whenever somebody buys them from my site. Must have people searching for them: I used Google Insight to check for interest in this topic. 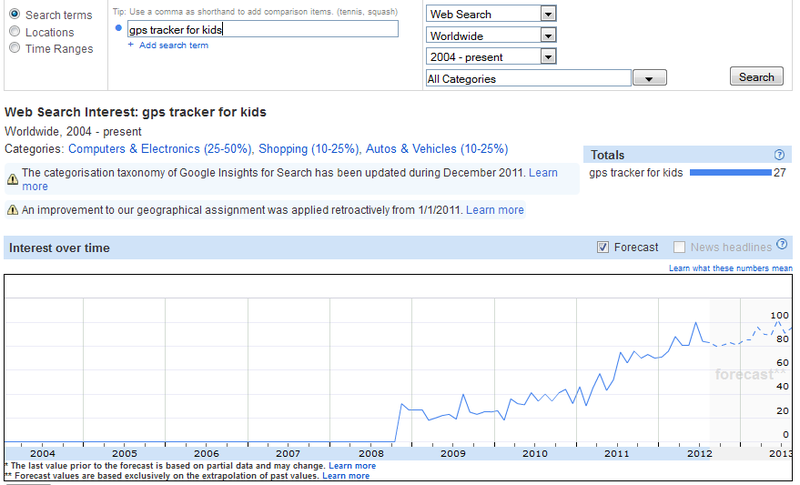 The screenshot below shows a nice upward curve of people searching for this term in Google. This indicates clear market interest. Get a few keywords that I want to be included in my content and site. These keywords will be what I hope my site can appear in when somebody searches for them in google. I intend to get about 10 to 15 articles with the above keywords on the site to see what happens. If there is any traffic, I will see what words people are using that is bringing them to my site. If these words are not very well covered in my site, I will write more articles to cover this topic comprehensively and increase the site’s relevance. That is all I will be doing in the next few weeks. Hopefully I will have more results to share with you in the future.